Hurrah! It’s your anniversary! And as you already know, it wouldn’t be complete without sending beautiful celebratory quotes and messages to your boyfriend. 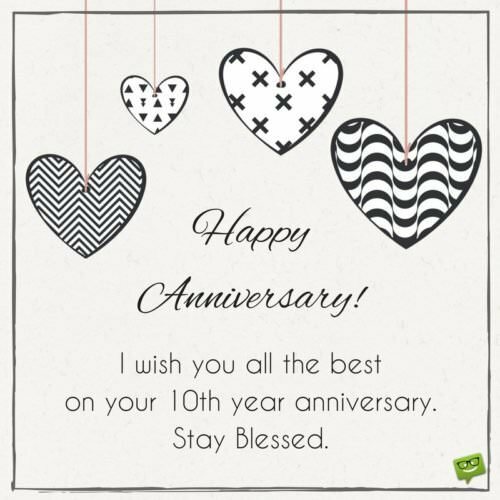 In light of that, we have created a list containing dozens of delightful, loving, and original anniversary wishes to help you decorate and add more glitter to that wonderful chapter of your relationship. We have this feeling your boyfriend would be greatly pleased to receive any of the following lines from you. Happy anniversary to the most wonderful boyfriend on earth! My sweet, handsome darling. I can’t thank you enough for making me the happiest and luckiest girlfriend in the universe. Wishing the happiest of happy anniversaries to my caring and loving boyfriend. Babe, may this day bless us with an eternity together. I love you very much. Happy anniversary, my love. May God continue to bless and protect our wonderful relationship. I love you. Honey, thank you for being the everlasting sunshine in my skies. May this awesome love that we share last until our hearts stop beating. On our anniversary, I want to thank you for being nothing else but YOU. I pray that God will bless this relationship and make it last forever. As long as we have each other in this world, luck will always be by our side. For being the sweetest boyfriend in the world, may happiness always reside in your heart. You deserve it. They say nothing in this world can ever be perfect. I think they say this because they haven’t seen our phenomenal relationship. Babe, thank you for making the love we share the most beautiful thing in the universe. To the World’s Best Boyfriend. Happy anniversary, dear darling. I wish us nothing but a great and absolutely happy life ahead. Nothing in this world makes me happier than the fact that I’m your girlfriend and you are my boyfriend. Being in this wonderful relationship with you has made my world infinite times happier and more colorful than I can ever describe. Thank you for treating me like a queen. As we reflect on the sweet and wonderful memories we have shared over the years, I can’t thank my lucky stars enough for bringing us together. Happy anniversary to the winner of the award for the “World’s Best Boyfriend”! May God bless you for making me taste true happiness. Being your girlfriend makes my life sweeter than all the honey in the universe. Honey, there’s only one word in the English dictionary that I can use in describing you. Phenomenal. You are absolutely phenomenal in all the ways that matter to me. I’m so lucky we hold the only keys to each other’s hearts. You are the sweetest love song of my life. There are billions of people in this world, but my eyes see only you because your soul sings a song only mine can hear. All my heart and soul desire is to love you and grow old with you. May our anniversary not only be ridiculously happy but also blessed. There’s nothing more in this world that I have loved more than being your girlfriend. Thank you for being my boyfriend, my best friend and my angel. The best day in my life is today because today is the day you and I officially became the sweetest couple in the universe. Happy anniversary to the most precious person in my life. To my love, happy anniversary. Here’s to another heavenly year of being the girlfriend of the most amazing boyfriend on the planet. May all our dreams and aspirations come true. You are the most beautiful love story of my life. I feel more blessed having you than I feel having life. Happy anniversary, my love, and thank you a gazillion times for making me feel brand new every single day. You are the reason we are the cutest and happiest couple in the world. May the Lord forever shine His amazing light on our union. There is only one source of true happiness in this life, and I find that place in your loving arms. Thank you for giving me a love story many dream of but never get. On our anniversary, I just want you to know that the wonderful love we share is not just a precious gift to me. It is my everything. It is my whole life. This is why I can never stop loving you. If God gave me all the time in the world to pen down why I love you so much, I still wouldn’t have enough time to write down all the awesome reasons my heart beats for only you. Thank you for all the enormous sacrifices you have made to ensure that our relationship remains the sweetest in the world. I couldn’t wish for a better boyfriend. I’m hanging on to you. Happy anniversary to my wonderful soul mate who makes me happy to be alive. My sweet love, on this special day of ours, may showers of blessings fall on our relationship and flood it so that we may know happiness all the days of our life. Wishing a very fabulous anniversary to the King of my heart. Dearest, our relationship is the most beautiful adventure of my life. Thank you for being the sweetest and most caring person I’ve ever known. Wishing a super duper happy anniversary to my darling boyfriend. Babe, may the years ahead of us be as beautiful as the sun that shines on our beautiful relationship. Happiness used to be a stranger in my world. However, since you came into my life, happiness calls my world its permanent home. On the anniversary of our love, I thank you for bringing oodles of bliss into my life. May we have a long and happy life together. May good luck follow our beautiful love story until the end of time. Happy anniversary, darling. May the immeasurable joy your love brings into my soul be returned to you a million times. I love you so much, my king. Wishing a blessed and glorious anniversary to the one and only love of my life. No one can ever take your place in my heart because no one can ever make me feel as wonderful as you make me feel. Sending my deepest love and warmest wishes to my heartbeat on our anniversary. Babe, celebrate this beautiful day, knowing that my love for you is the only endless thing in this universe. On this day that we officially celebrate our love, may God bless our union with an extraordinarily long life and unlimited happiness. 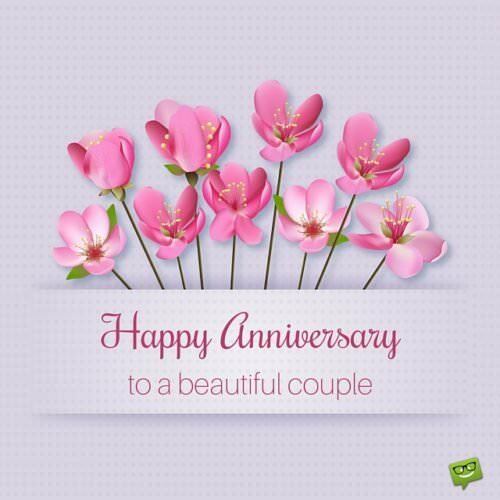 Wishing you a happy and memorable anniversary.